Experienced Enrique Samayoa (193-F-82) had an amazing evening in the last round for Villa Nueva and that's him to receive a Interperformances Liga Metropolitana Player of the Week award for round 11. The 35-year old forward had a double-double of 39 points and nineteen rebounds, while his team beat La Villa (#9, 2-7) 82-69. Villa Nueva is placed at 7th position in Guatemalan Liga Metropolitana. Villa Nueva is rather a weak team placed in lower part in the standings. They need more victories to improve their 4-6 record. In the team's last game Samayoa had a remarkable 64.3% from 2-point range and got six three-pointers out of 7 attempts. He turned to be Villa Nueva's top player in his first season with the team. Samayoa has impressive league stats. 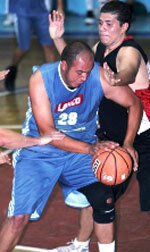 He is in league's top in rebounds (3rd best: 11.7rpg), assists (7th best: 3.7apg) and averages solid 52.0% FGP. The second most remarkable performance in last round's games was 27-year old former international swingman Miguel Gonzalez (187-G/F-90) of second-ranked USAC. Gonzalez impressed basketball fans with a double-double of 21 points and 13 rebounds. 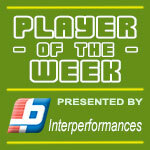 Of course he led USAC to another comfortable win outscoring the lower-ranked Vacasi Sport (#5, 5-5) 77-42. USAC's second position in the standings has not changed. His team lost just one game this season, while they won 8 matches. Gonzalez is a newcomer at USAC and it seems he did not have too much trouble to become one of team's leaders. He belongs to the best scorers in the league with 21.3ppg (#1). His other stats are also decent: 9.6rpg and 4.9apg. The third best performed player last round was Walter Ramirez (97) of Amatitlan (#3). Ramirez got into 30-points club by scoring 34 points in the last round. He went also for thirteen rebounds . 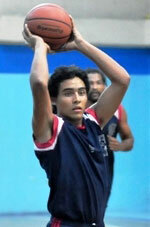 He was a key player of Amatitlan, leading his team to a 103-78 easy win against the lower-ranked GMS (#10, 2-8). Amatitlan needs these victories very badly if they think about getting closer to top teams. Their record at this point is 6 victories and 3 lost games. Ramirez has a great season in Guatemala. After only 8 games, he made it on the list of the league's leaders in points with 20.0ppg (3rd best).